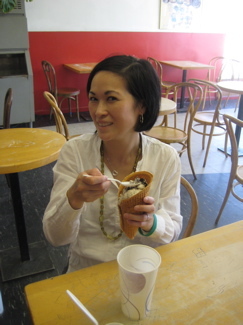 Fact: Hoang never complains or rolls her eyes when I tack on an ice cream visit after another day of museum-going or other such Saturday activity a CTMQ wife must sometimes endure. 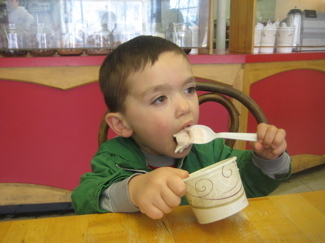 And it’s not just because the girl likes her ice cream; it’s because Damian is almost always well-behaved when confronted with a frozen treat. He suddenly “forgets” he has difficult special needs and just concentrates on the task at hand. If only ice cream was the nutritional equivalent of fresh vegetables. 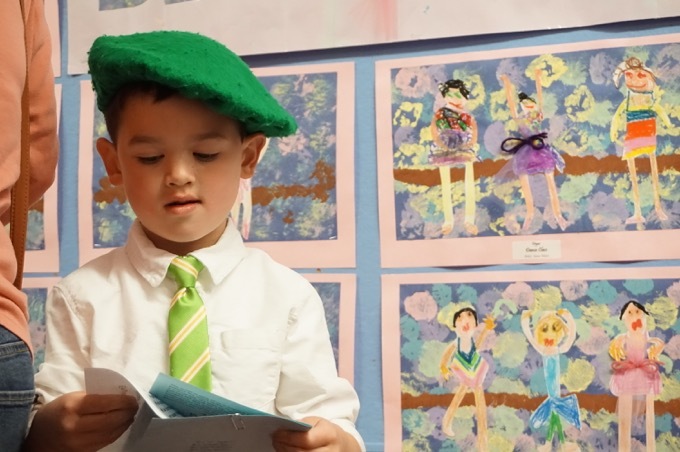 Eh, he’s four. We can pretend. Ahh, Bridgeport. Not exactly everyone’s favorite Connecticut city, that’s for sure. 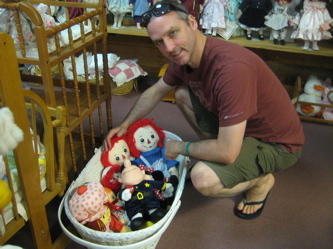 (Though it was PT Barnum’s, so that should count for something.) Despite being in “the richest county in America,” Bridgeport went infamously bankrupt not too long ago. (This is because Connecticut still hangs on to the awful 169 independent town structure, which means none of those wealthy towns pay a dime into Bridgeport’s tax base. Our cities will never, ever get any better unless this antiquated idea is changed. And good luck with that. Anyway, I had no issues driving down Fairfield Avenue and found it to be fairly vibrant and interesting. I can only assume Timothy’s has been in this location forever and is still good enough to draw in suburban visitors in their Audis and Minivans. It also still attracts sadly obese families wearing Ed Hardy shirts and dirty sweatpants. At least that’s who we had the pleasure of enjoying our ice cream with while we were there. Sigh. 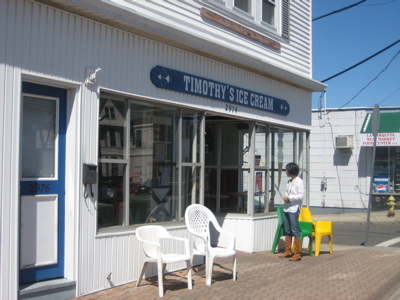 Timothy’s no longer uses the salt-and-ice churners that stand in the front window, but the ice cream made here remains classic. It is simple, rich-but-not-cloying, sweet-but-not-too-sweet ice cream; ice cream that is, in our book, just about perfect. Several dozen different flavors are made in regular rotation. Among the must-eats are Sweet Cream (the purest ice cream of them all), Black Rock (French Vanilla studded with chocolate covered almonds), Dutch Chocolate, Peach, Oreo Cookie, and Banana. Any flavor can be souped up with mix-ins of any kind. 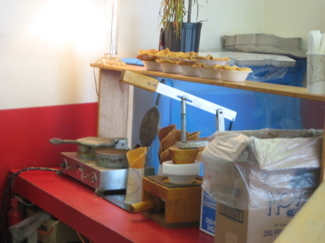 If you choose a sundae, you can have it in a paper cup or in an edible waffle-cup made in one of the pair of waffle irons behind the counter. (Waffle cones are also available.) Sundaes are spectacular, blanketed with silky fudge and whipped cream that is scooped from the big silver bowl in which it is whipped fresh throughout the day. Timothy’s certainly has the whole “lore” thing going. They’ve posted up articles from the last 20 years or so to yellow on the walls. 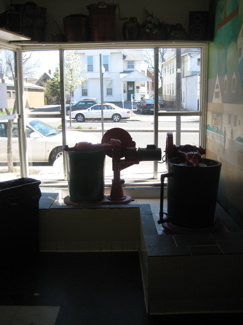 The shop is large for an ice cream shop, and smells almost too-sweet from the cone making machines that dominate the counter. The menu seems almost purposely slap-dash, like a ransom note cobbled together from the pages of various magazines. But who cares, some of the best food in the world comes from ramschackle clam shacks at stereotypically dilapidated docks. 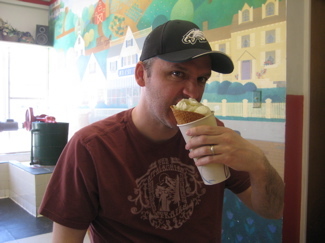 I had never had – or ever heard of – sweet cream ice cream before. This is interesting (and shows that I was born in the seventies) because sweet cream is just plain ice cream. 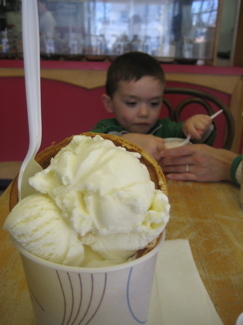 As I just read on the InterWebs, “sweet cream ice cream is properly made of just cream and sugar and nothing else. (like Vanilla, but without the vanilla, you know? )” Sure, now I know, you know? For the rest of what turned out to be an interesting thread, check it out here. Despite the corporate Cold Stone Creamery now selling this flavor, it does seem to be somewhat rare. And rarer still to get top-notch sweet cream. And that’s where Timothy’s comes into play. I think a) not many people order straight up sweet cream and b) those that do usually add something mixed in like M&M’s or nuts or something. Not me man, I’m a purist. And really, when am I ever going to have this again in my life? While Damian ate his usual strawberry concoction of some sort and while Hoang enjoyed her surely delicious flavor I can’t remember, I experienced my first sweet cream. It’s funny that they call it “sweet” because this is surely the least sweet ice cream I’ve ever had in my life. That is NOT a knock on it at all, just an observation. And yeah, it’s just “cream” flavor. With a hint of sweet. And I loved it. Well, that’s all sweet cream ice cream is, except fattier and obviously richer. I will admit, if and when I ever get this flavor again, I’ll most likely get some add-in of some sort. Maybe some Reese’s Peanut Butter Cups.